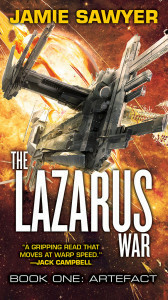 This week marks the third release in THE LAZARUS WAR series – the novella REDEMPTION! These are exciting times for me, with the series moving on at lightspeed. Today I’m going to explain sequence of the books and the order in which you could (and probably should!) read them. So here’s an update on the war so far! In the 23rd century, mankind has spread out into the stars, only to find themselves locked in eternal warfare with the insidious Krell. On the farthest edges of known space, a stalemate has been hard won, and a Quarantine Zone is being policed by the only people able to contain the Krell menace: the brave soldiers of the Simulant Operation Programme, an elite military team who remotely operate bioengineered avatars in the most dangerous theatres of war. Captain Conrad Harris is a veteran of the Sim Ops Programme, a man who has died hundreds of times running suicide missions inside his simulants. Known as Lazarus, Harris is a man addicted to death, and driven by the memory of a lover lost to the Krell many years before. So when a secret research station deep in the Quarantine Zone suddenly goes dark, there is no other man who could possibly lead a rescue mission. Yet, on arrival at Helios Station, all is not as it seems. Ambushed by a Krell patrol, Harris and his team find themselves stranded planet-side, their simulants destroyed. Far from home, and surrounded by enemies on every side, Harris must find answers to a very real question: how does a man inured to the idea of dying, face up to the prospect of a real, unsimulated death? ARTEFACT, released in ebook in April 2015, is my first published book and marks the start of THE LAZARUS WAR. You’ll get a great introduction to Captain Conrad Harris, and the twisted, militaristic universe of the 23rd century: a future in which the nation-state has ventured into the cold, distant stars but left behind none of the animosity of Earth. Despite our claim to the galaxy, mankind is not alone out there – the Krell Empire spirals out from the Maelstrom, presenting the biggest threat that humanity has ever encountered. ARTEFACT can be read as either the first chapter of THE LAZARUS WAR, or as a stand-alone novel – the themes of the story continue into book two (and I’d of course recommend that you keep reading!) but it can also be enjoyed as a single-volume story. ARTEFACT is available now from all good ebook retailers, at the bargain price of £2.99! ARTEFACT will also be available in paperback format from February 2016. There will also be an audiobook download version available at the same time. 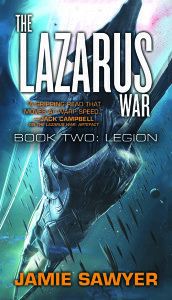 Released in September 2015, LEGION is essential reading in THE LAZARUS WAR series. It’s available in ebook at the low price of £3.99, from all good ebook retailers. LEGION will be released in paperback and audiobook in May 2016. 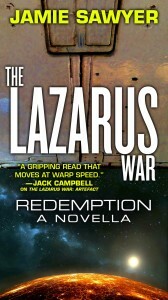 REDEMPTION is the first novella of THE LAZARUS WAR series, and also – as it happens – the first novella I’ve ever written. I’ve always found writing shorter stories to be more difficult than writing full-length novels, and so REDEMPTION was a challenge. But it was also a refreshing change of pace and viewpoint. As you’ll see, the setting is familiar – we revisit lots of the same locales, hear about the same events and even see some of the same faces – but the characters are different. Neither Taniya Coetzer, nor the crew of the Edison, are heroes or paradigms of the Alliance: but when the time comes, they’ll do what needs to be done. Set between the events of LEGION and ORIGINS, REDEMPTION might also be called LAZARUS WAR BOOK 2.5. Although you don’t need to read it to stay up-to-date on the progress of the war, if you enjoyed ARTEFACT and LEGION then REDEMPTION should definitely be on your radar! Released in November 2015, REDEMPTION will be an ebook only release (although more on that next year…). And the best news? REDEMPTION is priced at the all-time low £1.99 on Amazon! ORIGINS (if it ends up being called that, and I don’t change my mind yet again) will be released in ebook, paperback and audiobook in August 2016. E book only on redemption? What will us paperback junkies do? Anyway I can buy a basic print? I know, it’s a travesty. No immediate plans I’m afraid, but it’s possible we’ll be doing a limited edition run next year – these won’t be on sale but likely as a giveaway. Will keep you posted! Sir, this series of yours has all the makings of a Hollywood blockbuster! You seriously need to submit a script! Are you planning on writing another novel for this series? (Please say yes). Absolutely wonderful reading, some of the best sci fi I have read in decades. Well done sir, I look forward to more amazing work from you.